Applications are invited for the World Innovation Summit for Education (WISE) Accelerator Programme 2019-2020. The WISE Accelerator supports innovative initiatives developing solutions in education technology with high potential for scalability and positive impact. Each year, the selected initiatives join the one-year program, during which they benefit from tailor-made support to address challenges that hinder their growth and scaling up process. 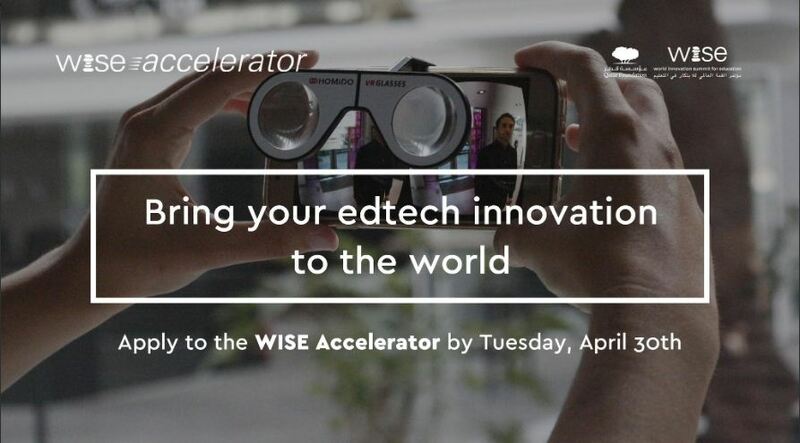 In addition, the WISE Accelerator assists the selected initiatives to connect with an international network of education stakeholders and create opportunities to share knowledge and find support among potential partners, donors and investors during international events organized by WISE. Finally, the selected initiatives will be matched with mentors who are experts in education, education technology and leaders in their field. Mentors will support the selected initiatives with advice, guidance and connections to different education and business stakeholders. Kick-off: Selected initiatives participate in the program kick-off to be held during WISE 2019 Summit in Doha, Qatar where they will benefit from workshops, masterclasses and networking opportunities. Needs Assessment: The WISE Accelerator team will evaluate the initiatives’ priority needs and identify optimal ways to address them. Tailor-made Support: This phase corresponds to the rollout of the mentorship and training provided by the WISE Accelerator team and partner organizations, combining both face-to-face meetings and mostly distance, personalized sessions. Mentorship: The WISE Accelerator team will match each selected initiative with mentors selected from a WISE community of over 50,000 education stakeholders. These mentors will advise, guide and support the initiatives in their growth. Often, the mentors are CEO’s and directors of for profit and non-profit education initiatives. Ongoing communication and visibility: The selected initiatives benefit from ongoing communication and international exposure, as well as from networking opportunities throughout the year. This takes place via WISE media platforms and international events. Program Closing: The program closing will also take part at a WISE international event in order for the selected initiatives to benefit from further opportunities for support, networking and international visibility. In the past, the international events took part in major cities such as Paris, New York or Madrid. Follow-up and Evaluation: During the selection process and following the conclusion of the program, the WISE Accelerator team will administer surveys to the shortlisted applicants as well as selected initiatives in order to evaluate the progress made over the year by the selected and non-selected initiatives with the aim to evaluate the impact of the program. The WISE Accelerator will collect information on the initiatives’ growth every six months for two years. At the end of two years from finishing the program, The WISE Accelerator team will collect information on the initiatives’ growth once a year. All information collected will be anonymized and collected with the permission of the initiatives. Applicants should read the application guidelines before submitting the online application. For more information, visit WISE Accelerator.